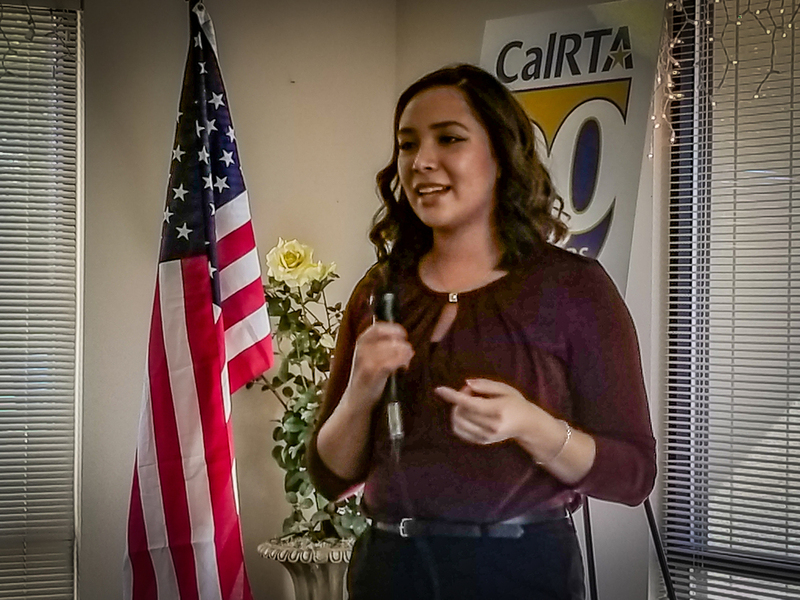 Chico, CA -- At the CalRTA Division 32 luncheon on Wednesday, October 16, Carolina Zavala shared a little about her personal journey to becoming a bilingual teacher. Carolina is also the 2018 recipient of the CalRTA's Laura E. Settle Scholarship at CSU-Chico. Carolina Zavala grew up in Moreno Valley, CA with her parents and three siblings. In high school, Carolina was involved in AVID, peer mediation, and varsity soccer cheerleading. She went on to UC-Irvine, and later transferred to CSU-Chico when her family moved to northern California. At CSU-Chico, Carolina joined the California Mini-Corps to give academic support to students from migrant families. (The California Mini-Corps was started by the Butte County Office of Education more than fifty years ago). While working with Mini-Corps students and families, Carolina realized that she loved teaching and decided to dedicate her life to teaching others. Carolina received her undergraduate degree in May, 2018, when she was also recognized as the outstanding liberal studies bilingual student at CSU-Chico. Over the years the Laura E. Settle Scholarship Foundation has awarded millions of dollars in scholarships to California's future teachers. The LES Foundation provides $3,000 scholarships to 30 colleges annually. Another 13 $500 grants from the affiliated Mabel Outler Scholarship Fund are also awarded to teachers who plan on working in elementary schools. The LES Foundation is funded primarily through contributions and bequests from CalRTA members. California Mini-Corps Program, through the auspices of Butte County Schools, was initiated in 1967, patterned after the Peace Corps program. A corps of college students with a rural migrant background was recruited to work as teacher assistant in migrant impacted summer schools. The Mini-Corps students were role models that hopefully would raise the aspirations of migrant students. A sense of commitment, dedication, responsibility and sensitivity was required of the Mini-Corps participants. The Mini-Corps students would be personally acquainted with their students and make home visitations to the homes of migrant parents. The program was only a summer program until 1974 when the school year programs were initiated slowly throughout the state. The Mini-Corps Program provides services to all the migrant regions in the summer and school year. Visit https://www.bcoe.org/california-mini-corps to learn more about the California Mini-Corps. Each year, Butte County Office of Education and CalRTA Division 32 partner to provide forty (40) $100 teacher grants to educators in Butte County.